Liberty Lake's Barlow's Resturant has outgrown it's current small location at 1400 N. Meadowwood Lane next to the STA Liberty Lake Park & Ride. And the answer to the problem? build new and build bigger and that's exactly what the owners of the restaurant our planning to do. Barlow's will begin work on a new building on a vacant lot along Liberty Lake Rd. in between Taco Bell and Starbucks . And although it's too early too pin point an exact opening date Barlow's does hope to open in their new building around October of this year. The new Barlow's Family Resturant will feature double to amount of dining room space as their current location and with the new larger space they will also be able to hire additional staff. Spokane is like many radio markets across the nation, dominated by the San Antonio,Texas based Clear Channel as the owner of many of it's radio stations. And with big companies often come many changes to keep profitable. Recently Clear Channel ended it's country formatted station Kix 96 for the new Hits 96.1 , pop/ top-40 format and now Clear Channel is changing it up for Spokane radio once again. Clear Channel has re branded it's station , KPTQ 1280 AM . KPTQ has been operating as a classic country station but is now a Sports radio station under the Fox Sports Radio Network and using the name 1280 FOX Sports Spokane. 1280 Fox Sports Spokane is a full sports station with games and highlights from several leagues and sports. Also soon 1280 will be home to the nationally syndicated Dan Patrick Show, a morning radio show with a following around the country. After 4 years as manager of The Q Sports Bar in Northern Quest Casino , local entrepreneur Scott Poole has officially opened his own pub of sorts in North Spokane which is already creating a name for itself it the growing and ever changing Spokane Bar and Restaurant scene. Poole's new business is named Poole's Public House and is located in the Wandermere area at 101 E. Hastings Rd. nearby Mead High School. Poole's Public House is open Mon-Fri 11am till close and Saturday and Sunday 8am till close. But what makes Poole's Public House different from the many other sports bars that can be found in just about every part of the city is Poole's is part traditional American but also a British Pub with dishes on the menu that aren't exactly common in Spokane. Menu items at Poole's include Bangers and Mash , Devils on Horseback and Myrna's English Po Boy. And if you don't know what Bangers and Mash or Devils on Horseback is , then Poole's Public House is the place to find your answer. Poole's Public House also a selection of British Beers as well. But if your not a fan of British brew's Poole's also has a selection of Domestic's and Northwest Microbrew's. Non stop flights from Spokane to Chicago coming in June. But now Spokane International has announced yet another new non stop air connection. Beginning June 2nd 2013 Southwest Airlines will begin service on a 143 passenger Boeing 737-700 to Chicago Midway International Airport. The new Spokane to Chicago flight will also create a direct link between Spokane and Jacksonville,Fla. as the same plane will continue on to Jacksonville from Chicago Midway. The new flight however, is at the present time a seasonal service and will conclude Sept 7th 2013. 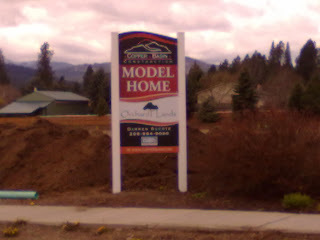 Orchard Lands, a residential subdivision on Atlas Road about .5 miles north of Seltice Way on the western edge of Coeur d' Alene was originally brought before city council for consideration in the mid 2000's, but many factors hit the residential development and caused the project to stall out all together . Since then Orchard Lands has sat as a "ghost subdivision" , with all the infrastructure in place but one very important thing missing, homes. But it is now 2013 and the local economy and housing markets are bouncing back and Orchard Lands finds itself bouncing back as well. Orchard Lands is now back in business and being sold by the local Coldwell Banker Schniedmiller Realty office, with agent Darren Ducote as the primary contact. Homes in the project are being built by Copper Basin Construction of Hayden and the signs at each entry point note that new homes are available from the 100,000's and home prices do vary from the mid 100,000's to over 200,000 depending on the style and size of the home, for more info on pricing contact the agent in charge. 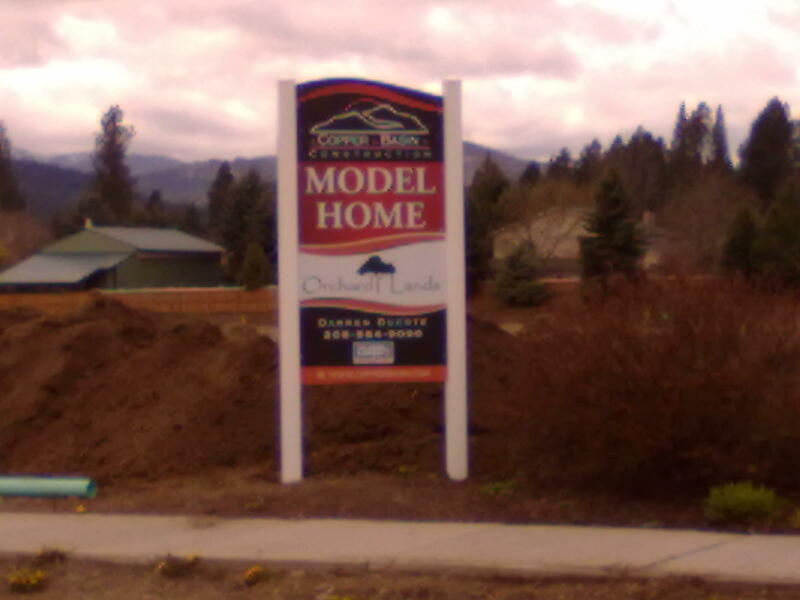 Some construction has already started at the Orchard Lands site with a model home coming in the near future. It's unclear as to the exact number of new homes that will be built at Orchard Lands however the site is large and stretches along Atlas from Appaloosa Dr. in the north and the freeway on the south. Homes at the new subdivision can also include space for an RV and have numerous upgrades that can be added for a price. Image taken 04/20/2013 by Inland Northwest Business Watch staff. Looking for a new way to work out? Well maybe Boxfit is your answer. Boxfit is a new business that opened recently in Spokane on the middle of the Division St. hill at 3117 N. Division. Boxfit Spokane is a boxing gym that is located in a 6,300 square foot building. Boxfit is open to all skill levels from a professional fighter to a member of the general public who wants to try something new. The gym offers a circuit style boxing work out and a 2,300 square foot space dedicated to building power and agility. Also Boxfit offers regular classes and private one on one training sessions. Boxfit is open Monday thru Friday 9am-1pm and 3pm-9pm , Saturday 10am - 4pm and Sunday 1-3pm. Membership is the gym is available via a monthly fee with a one time registration fee. NIC looking into building a new arena at Riverstone in Coeur d' Alene. The process is very early in development however the topic of replacing the aging , on campus Christianson Gym with a new much larger arena elsewhere in Coeur d' Alene has arisen and is already creating much buzz in the Coeur d' Alene community. An arena on land in the same district of Coeur d' Alene has been studied before but eventually fizzled out. We will continue to watch this story as it develops. NIC leases space for it's new aerospace program. North Idaho College has signed a lease on a 15,000 square foot building along Dakota Ave nearby Pappy Boyington Field Airport in Hayden. The new building will be used for the college's new aerospace training program which is set to begin later this year and is funded by a grant which the school acquired in 2012. The new building at the Airport will in turn save money for the school as the new building is also big enough to house the schools operations and classes that take place in the Ramsey Technical Building, located in Coeur d' Alene along Ramsey Rd. nearby the Kroc Center. The school will move out of that space and end it's lease for that building. NIC to get new coffee shop in the SUB Student Union Building. Renovation work has already begun on the main floor of the SUB Student Union in the middle of campus at Coeur d' Alene. The renovations are being done to make way for a new coffee shop space in what was once the Windy Bay room nearby the building's main entry. The new coffee shop will replace the much smaller coffee stand called The Educated Cup which has been by the Mica Peak Exchange Book Store. Once the coffee shop moves the former space will become a help desk for a college program. Basement of NIC'S SUB Student Union Building proposed to be turned into a multi-cultural center. The basement level of the SUB building is to become an on campus multi-cultural center . The basement is already home to office space for the school's American Indian Student Alliance and additional office space will be taken over by the student program,The Gay-Straight Alliance. Also some minor renovations and redecoration's are planned for the space. Some of the current office space tenants may also move to the main floor but planning is not yet complete for what the multi-cultural center might include. Command Center a North Idaho based company that provides temporary staffing for a number of fields from a number of locations scattered around the United States in undergoing some changes. Command Center was founded in 2002 in Post Falls and has operated it's headquarters in a building at 3773 W. 5th Ave since it's founding by then CEO Glenn Welstad. In February of this year Welstad resigned from his post as CEO and the helm of the company has was taken over by Frederick Standford. Along with the change on the companies executive level the company has also recently relocated it's headquarters. Command Center's home offices have been moved from Post Falls to Coeur d' Alene , with the offices now located at 3901 N. Schreiber Way in the Coeur d' Alene Commerce Park nearby the Coeur d' Alene Police Department's offices. In all Command Center employees over 200 permanent employees and it claims to have placed 10's of thousands of people in temporary work positions nation wide. Command Center operates 59 office locations in 24 US States. Locally Command Center operates 2 locations, One in Spokane at 3803 N. Division St and in Coeur d' Alene at 1323 E. Sherman Ave. Both nationally and even here in Spokane / Coeur d' Alene food trucks are a huge hit. New trucks are hitting the road all the time and each time they have one common denominator, food ,usually greasy not exactly healthy food but still food. But as it would turn out, food isn't the only thing that can be sold from a truck and one Spokane business is proving that with the opening of Spokane's first Fashion Truck. The new truck is from Swank Boutique a women's clothing store who's brick and mortar store is located in the Northtown Square Shopping Center at 4727 N. Division St . Suite 100D . The truck which is pink and mentions the name Swank a go go on the side is available for private parties and public events. Sykes Enterprises the Tampa,Fla. based owner of a call center in Spokane Valley at 2818 N. Sullivan Rd has announced it has plans to close it's local center sometime in May. The call center takes calls for a variety of national companies that Sykes cannot name, in all the Spokane Valley call center employs about 150 all of which will be laid off. Sykes notes however that the jobs lost locally will not be added in another market and are part of a routine business adjustment. Sykes will allow it's local workers to apply for the companies at home calling contracts where employees take customer service calls in their own home as opposed to at a large call center, an option also made available by several large call center operators. Sykes Enterprises operates more then 80 call centers in all, some in international locations . The closure will leave no presence by the company in the Spokane market. Sykes acquired the local call center from the firm ICT Group. ICT Group operated the call center in a large former department store space at U-City Mall along Appleway also in Spokane Valley. At one time in the call center's history, while under the operation of ICT Group, the center employed more then 1,200. Apparently with a more prosperous local economy comes a sudden rush of building upgrades and remodels in Downtown Spokane and other area's around Spokane. Most of the other remodels have already been covered in posts here on Inland Northwest Business Watch but today will look at one of the biggest purposed projects in the Downtown area. That project is the complete remodel and re-brand of the Sherwood Building and Sherwood Mall Building. The 2 buildings are attached to each other and located directly next door to each other by the corner Riverside Ave. and Stevens St. in the heart of Downtown Spokane. They , like many commercial buildings have struggled in the last few years to attract and keep tenants. The Sherwood Building was home to a large portion of the Spokane based Sterling Bank's offices but even they have since moved out. Sure the Sherwood building does still have tenants but a lot of the space could use a refresh of sorts. And hope has arrived as in March it was announced that 2 buildings have been sold to 2 local real estate investment groups, one of which is led by Bobby Brett who is also the owner of the Spokane Indians baseball team and the Spokane Chiefs hockey team. The new building owners plan to remodel much of the buildings and re brand as the Numerica Building, With Numerica Credit Union moving a new branch into the ground floor space directly at the corner of Stevens and Riverside. Also the space that was Metro Café on the building's 2nd floor until it closed recently will be re done into office space that will be occupied by Nystrom & Olson Architecture. Additional new commercial space will also be available on the 2nd floor, and plans do call for a new coffee shop to open in the building as well. Renovations at the Sherwood Building are expected to begin sometime this spring. Keep watching Inland Northwest Business Watch as this is one that we try to follow up on as news and post space becomes available. CONFIRMED: Target to open a store on the South Hill. This week we finally got the confirmation we here at Inland Northwest Business Watch have been looking so hard for. Spokane will get a 3rd Target store and that new Target will open on the South Hill as part of the Southgate District Center project by the corner of S. Regal and Palouse Hwy. We don't have an exact look or anything from Target , nor do we know if the store will also include a grocery section similar to the Target's in North Spokane and Coeur d' Alene. It is strongly believed however this new store will not look exactly like the others in the area and will most likely be a "prototype" style store. The store is expected to be 136,000 square feet and will be located towards the back of the land with and entry points onto both Palouse and Regal. The site is being developed by local developer David Black. Site work for the new store is expected to start soon and early plans call for the new store to open in early 2014. 2013-2014 Best of Broadway Spokane show line-up announced. This past week the 2013-2014 Best of Broadway Spokane shows we're officially announced. I realize it's not exactly business news but it is a hot topic and does greatly help the local economy. Also coming soon will be the announcement for the 2013 Pepsi Summer Concert Series at Northern Quest Casino. That show announcement is expected ether late this month or in May. Keep watching Inland Northwest Business Watch for that show announcement as well. All shows below are scheduled to be at the INB Performing Arts Center in Downtown Spokane. Season ticket's are also available, info on those can also be found on the Best of Broadway Spokane web site. The Interplayers Theater is looking for the communities help as the community play house located in the 100 block of S. Howard St in Downtown Spokane now finds itself faced with a goal of raising 150,000 dollars by May 31st to keep the operation, in operation. The sale of the building itself last year to the Jerry and Patty Dicker Foundation has allowed for big changes to the theater itself and got Interplayers out of 80,000 of it's prior debt's but while it's shows have made a profit the group has struggled to make payments on the remaining debts and building overhead. So how does the Interplayers Theater plan to make up the 150,000 it needs to stay open? By looking to the community and especially the business community, a portion of the community that Interplayers had not looked to for funding in the past. Also thru the sales of the season ticket subscriptions, This past week Interplayers announced their 2013-2014 show line up. Tickets are on sale for all the shows but should the Interplayers be forced to close ticket holders will not be charged for their ticket purchase. Info on the 2013-2014 show line-up is at the bottom of this post. Ticket and season ticket info is available on the web site mentioned above. Bluez at the Bend to close at the end of April. The popular blues club , Bluez at the Bend , located on the first floor of the building at 2721 N. Market St in Spokane is closing it doors later this month. The club who's owner's Don Perkins and Maryanne Snyder have had up for sale for a while now will go out with a final show on April 25th. Perkin's other business, Uncle D's Comedy Club which is located on the second floor of the same building will remain open. Capone's Pub and Grill now open in Hayden. After months of construction at the former Corey's Furniture building at 9520 N. Government Way near the intersection of Government and Hayden Ave in Downtown Hayden is now open. Capone's is a local landmark bar which also has locations in Post Falls and it's flagship location in Midtown Coeur d' Alene. The new Hayden Capone's is a full bar as well as full service restaurant with seating for 150+ , The new Hayden location's menu is the same as the other Capone's locations with pizza and general bar dishes. The new location employs 35. Event Rents opens in new Spokane location. Event Rents , A full service event rental service has moved and opened in a new larger location at 4020 E. Broadway in Spokane Valley. Event Rents rents everything from tables and chairs all the way down to the flatware. Originally located in Moscow,Id some time ago. The small Northwest Tattoo Museum has re-opened in Downtown Coeur d' Alene at 510 N. 4th St. by Blue Rose Tattoo. The Northwest Tattoo Museum is a museum dedicated to tattoo history, with old tattoo machine's and various other pieces of equipment. Another new fashion store is opening in Spokane Valley Mall in Spokane Valley. Francesca's is a women's clothing store chain that began in Houston,Texas back in 1999. Artcolab opens in Downtown Coeur d' Alene. Officially opening for ArtWalk Coeur d' Alene last Friday , Artcolab , is the newest of the many art gallery's and studio's that dot the Downtown Coeur d' Alene area. Artcolab is billed as a creative artist laboratory and is unlike most of the other art businesses already in Coeur d' Alene. Artcolab is both an art gallery and a art studio, the new business also provides creative office space for other businesses in similar fields such as art, web site design, photography , graphic design and the like. The first tenants of the new Artcolab space are Born Inviceable Design and Jerm Design. Artcolab is easy to find in the Downtown area just half a block north of Sherman on N 4th St ( address is- 108 N. 4th St ) . The space was last Dangerous Dog Serious Sausage. Know of any new business coming to the area? Those with an interest in plays and the preforming arts have a new local venue in Downtown Spokane with the recent opening of the Stage Left Theater located in a small storefront at 108 W. 3rd Ave near Division St. . The Stage Left Theater is owned and operated by a community theather group that was formed a little while back but only opened the new theater in early 2013. The new Spokane Stage Left Theater will be open to the public during an open house planned for Sat. April 13th from 4 to 6 pm. Sports Authority celebrating Grand Re-opening of it's North Spokane store. Sports Authority , which is one of the nation's largest full line Sporting Goods retail chains is celebrating the Grand Re-opening this weekend of the their store in the Northpointe Shopping Center in North Spokane. Sports Authority has completely remodeled it's 45,000 square foot store and created a brand new floorplan with specility sports shops and a spacious layout the new store is more user friendly but yet still stocked with the same products many in Spokane have trusted Sports Authority to have for years. For example Sports Authority sells brands like : Nike, UnderArmor , The North Face, TaylorMade and much more. The grand re-opening is being held today , April 6th and contests for $100 gift cards are held hourly also a contest to win a $500 shopping spree will be held from today till April 13th. The North Spokane Sports Authority store is located at 9620 N. Newport Hwy. . Store hours are Monday thru Saturday 9am to 9:30 pm and Sunday 9am to 8pm. Sports Authority is in the process of opening a new store in Coeur d' Alene at the Silver Lake Mall. That store is planned to open in May, more on that grand opening when it is closer. Update on the new South Hill Target,and the Southgate District Center. Last week I posted some info on the INBW web site about the rumored new Target store said to be opening on the South Hill nearby the corner of S. Regal St. and Palouse Hwy (That post can be found here - http://www.inlandnwbusiness.com/2013/03/target-opening-store-on-south-hill-not.html ) . Since then however even more about this project has come to light, and it's looking even better that Target will open, and although it is only speculation, I would expect them to open sometime in 2013. The page has posted the site plan for the site which shows a large retail building on the eastern end of the site with entrances on the side of the building onto Palouse Hwy and a front main entry onto Regal just south of the intersection of Regal and Palouse. What's also interesting is the page also gives a glimpse into what else is planned for the retail development, that is using the name Southgate District Center. Although it is also not confirmed a new Walgreen's store is also on the site just south of the main entry point, on Regal St. . The plans posted recently on Facebook do appear to be rather preliminary however as some other example site plan's are also given. All of which do include a site large enough for Target and a few other un-named retail spaces. -Aces Community Services has opened a new office at 416 6th St.
-Valerie's Flowers is now open in a new location at 412 5th St.
-Farm Girls & Flip Flops Tea Shoppe is opening at 518 Bank St.
Coffee / Espresso drinkers in the Hayden area have a new choice when it comes to where to get their extra boost as Caffe Capri is now open in the Prarie Shopping Center along Prarie Ave. in between US 95 and Government Way in the town of Hayden,Idaho. The new Hayden Caffe Capri was last a location of the Seattle based Tully's Coffee chain. Caffe Capri is also a chain establishment with it's coffee roasting done in Seattle but operated locally. Caffe Capri also has locations in our region in Spokane and Yakima. The Hayden Caffe Capri serves espressos,frappes, smoothies , espresso ice cream shakes as well as snacks and other baked goods. The new location has a dine in area on site and a easy to find location next to Rite Aid and SportClips in the large shopping center just blocks north of the City of Coeur d' Alene. The Riverwalk mixed use complex located just east of Downtown Spokane, along the Spokane River will soon see a new look ,new space and even soon new apartments. Uptic Studios of Spokane is the designer for the project which will start soon. -A remodel of the main entrance which will include a new outdoor padio area. -A new 12-18 unit apartment building to be built on the northern portion of the property. -Rehabiliation on the trail connection from the Iron Bridge to the Trent Ave. bridge. Riverwalk is located along Trent Ave at the corner of Columbus St. and is home to the NoLi Brewery as well as a few other local businesses.